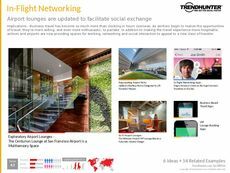 Find Better Ideas, Faster ® with a custom flying trend report, our PRO Dashboard and 80+ categories of premium trend reports. The Flying Trend Report covers the experience of air travel, from the moment the customer purchases their ticket to when they touch down at their destination. The modern traveler plans every aspect of their trip through apps and websites, and this report examines the most effective uses of these tools as they relate to air travel. 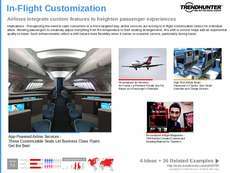 Innovations in security, convenience and luxury travel are also presented. Airline marketing is equally important, and success stories such as WestJet's consumer experience personalization are analyzed. This report is an important tool for professionals in the air travel and hospitality industries. Those seeking innovation in the consumer experience of flight booking, airport hospitality or the flying experience itself will find valuable information enclosed. Marketing professionals will also benefit from examples of effective airline branding and campaigns. 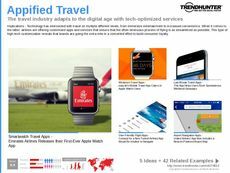 The Flying Trend Report offers a holistic look at the modern experience of flying, wherein consumers expect a new standard of connectivity, convenience and personalization from their airlines, airports and travel professionals.